Personally, I love timing things. I'm trying to jam on the last stretch of my novel. I work well for an hour at a time, but that's all I can manage unless I work up to it like it's exercise. I can only do the dishes for 15 minutes at a time. Otherwise I feel like some kind of domestic hostage. Here's a new one for me: 15 minutes a day on sorting clothes in the bedroom. It's a disaster area right now. Many of said clothes need to just GO. I think new year's resolutions don't stick if the motivation is not really strong. About seven years ago I made resolution that I must work out because if I did not I would be a very weak old lady. I have kept my workouts at the gym faithfully for the past years and actually enjoy them. I am stronger and know that the serotonin boost helps me also. My i pod gives me the extra fun that I need to work out. I'll be checking into your blog to see how you're doing and to see if I can pick up any pointers on dealing with writers' block. Is there any way to subscribe so I know when you've updated? Erin, I'm impressed--2 hours organizing your basement! I could not make myself go down to my dungeon/ basement today. I think that I see alot of myself in you -- My tendency is to store endless "to do" and mental guilt lists. What I'm trying to learn is to trust my mind and body - savor those breakfasts - give yourself a break. When you feel truly refreshed, you'll naturally turn to those things you really want to do and some things may fall by the wayside as other emerge. Trust yourself to take care of what you need. Resolve to laugh more every day at your to do list! That’s exactly what Rick tells me: give yourself a break...Resolve to laugh more every day at your to do list! Okay, I'd best stop now right? Let's see how I do with this list for a week. I join the chorus urging you to show yourself some compassion, Karen. 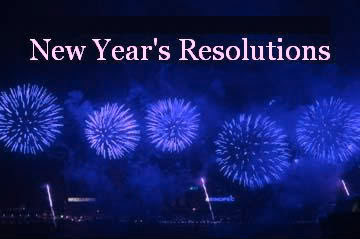 You manage to get a lot done whether or not it's via resolutions! Work on that book so I can read it, please! Two years into retirement from a private psychotherapy practice, I find that my days dissolve on me quickly, too. I make short daily to-do lists that include a couple of things I Want to do (blog, exercise), a couple I Could do (dust, return a call that can wait), and a couple of things I Must do (pay bills, clean garage for 1 hour). I label each item as W, C, or M. At the end of the day, if I checked off the W's and the M's, it was a good day. Some of the C's move into the M slot the next day. I'll be following your progress and glad to have found you...feels right at home, here. I've just retired too and I'm going through h***. I miss working and I also miss the idea of having a profession. It's tough. I think having a to do list every day is good, yet I've had a "to do" list for so long I'm not sure I want that. I'm going to blog follow to see how you do. I'm documenting my retirement journey too. Thanks for your suggestions! This is one of the great challenges of retirement—providing our own structure now that we no longer have the structure of work. Mary, I think we still have our careers even in retirement. "It's hard to learn that we don't leave the best parts of ourselves behind, back in the dugout or the office. We own what we learned back there. The experiences and the growth are grafted onto our lives. And when we exit, we can take ourselves along -- quite gracefully." I’ve had similar thoughts but have never been able to express them so well.